GAP has often been associated with the mapping of species-rich areas or “hotspots.” Species richness maps identify where species co-occur in the same geographic locations. For AKGAP, species richness is the total number of animal species per 60 m pixel across the state. The resultant map is shaded in intensity from the highest numbers of known or possible co- occurrence (richness) to the lowest. Richness maps provide a useful starting point, in combination with other types of information, to examine conservation opportunities. Total species richness by 60 m grid for 347 modeled amphibian, bird, and mammal species. 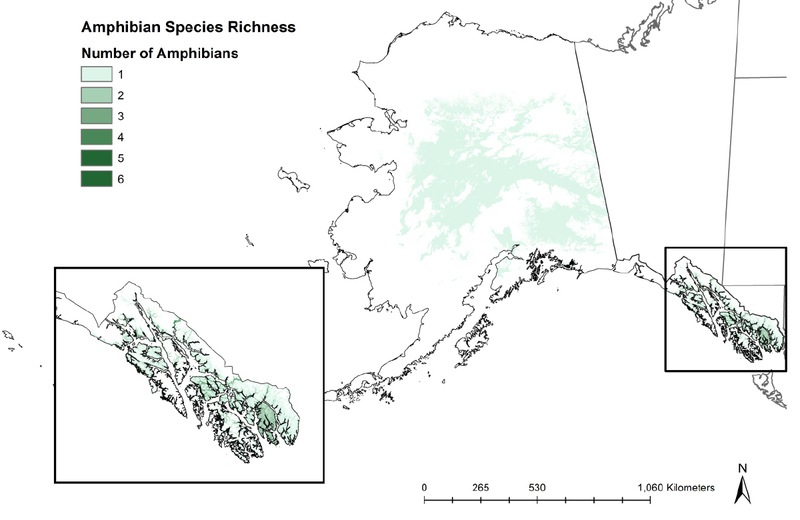 Amphibian richness is highest in Southeast Alaska. Richness values range from 0 to 6 species. Many amphibian taxa are at the northern distributional limit of their range in the temperate rainforest of southeastern Alaska. Only one amphibian taxon, the wood frog, is found throughout the interior of Alaska. Amphibians have not been documented in northern and southwestern Alaska. Species richness by 60 m grid for modeled amphibian species. Bird richness values range from 0 to 97 species and follows a similar pattern to overall taxa richness. Highest values are observed in central interior Alaska, in southeastern Alaska in coastal areas and along major rivers, and in western Alaska in areas adjacent to the Yukon and Kuskokwim River Deltas (Figure 9). The mainland region of Southeast Alaska has several unique species that are at their northern range limit, which add to the richness count in that region. In western Alaska richness is highest in several localized areas including in the Yukon-Kuskokwim Delta wetlands and estuaries, the southern half of the Seward Peninsula, and the Nulato Hills region. 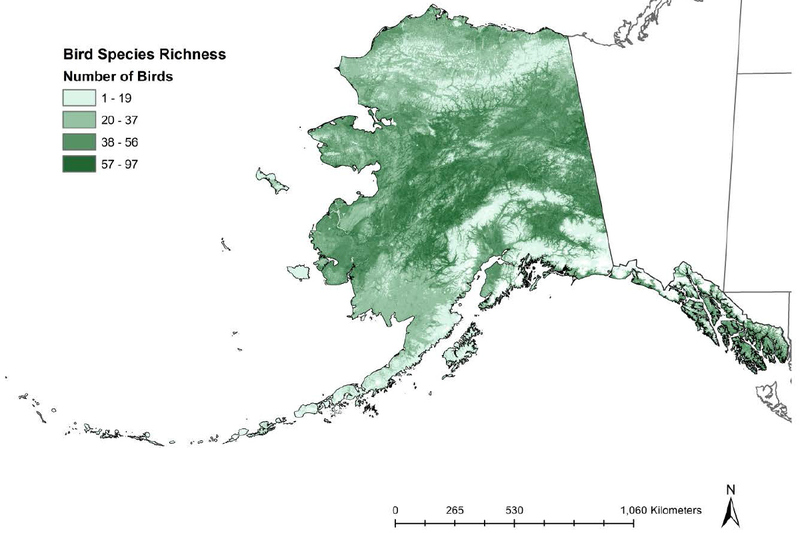 Bird richness decreases from interior Alaska northwards onto the arctic coastal plain. Similarly, richness decreases from the Alaska Peninsula and westward out the Aleutian chain. Species richness by 60 m grid for modeled bird species. 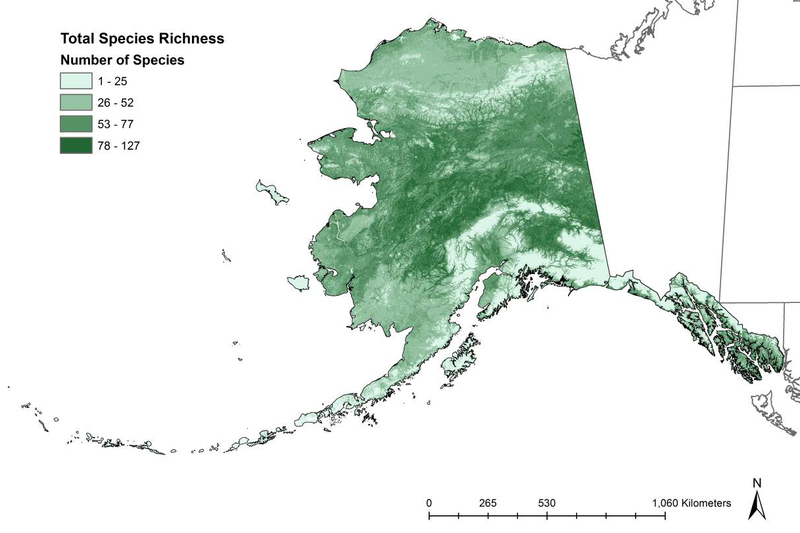 Mammal richness is highest in the southeastern, southcentral, and interior regions of Alaska (Figure 10). Richness values range from 0 to 36 species. Islands tend to have a lower diversity of mammals compared to the mainland, as seen by the lower values on islands in the Bering Sea, Gulf of Alaska, and Pacific Ocean. Species richness by 60 m grid for modeled mammal species.